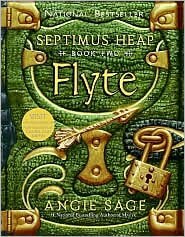 Dark Omen (aka my 11 year old son) will be reviewing Book 2, Flyte, of the Septimus Heap series, by Angie Sage. Flyte, the second book in the Septimus Heap series by Angie Sage is a good story. It has clearly defined good and evil (though which characters are on which side is less clear), an impressive cast of characters, and a whole lot of magic. I may go into more detail on this in a later blog, but now I want to share what to watch for while you read. The first thing that you have to look out for, especially with young readers is the length and the evil. Not counting the covers, this book is 1½ in. thick. This may not be a problem with older readers, but it takes a lot of perseverance for anyone under eight, especially if they only read it once a day at bedtime. Also, the evil side has some chillingly evil followers like DomDaniel, Simon Heap, and Marcia’s Shadow whose Darke Magyk will terrify young people. Then there is a whole other array of disgusting, repulsive Things such as magogs and land wurms. This is not to mention the high level of complexity that would fill up the whole Ink Spells site to describe. Depending on your child, it might be scary for kids under 10. The other thing to watch out for is that a bunch of time passes between Magyk (the first book) and Flyte, and that Angie Sage doesn’t explain things twice. This means that if you haven’t read Magyk you’ll have a hard time understanding Flyte. It also means that even if you have read Magyk, you will have to use your best reading skills to decipher how things changed, and what those changes mean in the story. You can refer to a section at the end of the book called “WHAT HAPPENED BEFORE…” but it does not cover everything. Thank you, Dark Omen! My son says that the “love stuff” is “hardly noticeable” and that Septimus just “gives Jenna some chocolate charms and she gives him a pretty rock” which, along with peril of characters, earns this book it’s PG rating. Although I haven’t read Flyte, it sounds like it is safe and a nice challenge for advanced readers 8+. « What the munchkins are reading . . . Your review is very informative and I will forward it to my 10 year old son (nickname Solid Snake. )I esp. like the way you list important points to consider for various age groups. Thanks! I did try to focus on ratings and age groups so parents would know which kids should read it without having to read it themselves! P.S. Does everyone have a nickname now?